How Much Of Face Products Should You Use? Often times, especially when we are new to skincare, we wonder how much of the face products we have is right to use and we feel uncertain of whether we are using the right amount. Using the right amount of products on your face and under your eyes is important because if you use little, they are not going to be effective enough and if you use more than what it is needed, they can block your pores and cause breakouts or, in some cases depending on the products, even dry and irritate your skin. Of course, it also depends on the kind of products you are using, for example if they are serums, cleansers, moisturizers or creams. You also need to keep in mind something very important when applying moisturizers and creams. 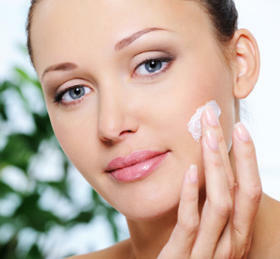 The degree of absorption of your moisturizer will highly depend on how clean your complexion is. If your skin is properly cleansed and exfoliated, your serum and moisturizer will absorb easily and all the active ingredients will work a lot better. So, the key to efficiency is not only effective skincare products and the right amount of them but also a properly cleansed and exfoliated complexion that will easily absorb the products’ beneficial ingredients for maximum results. Now, let’s see how much of your face products it is good to use each time. How much Face Cleanser should you Use? If you are using an emulsifying cleanser, you might have noticed that most of the times the amount you use is more than enough. This is what usually happens with emulsifying cleansers that are not contained in pump container bottles. If you have a pump container cleanser whether it is a foaming cleanser, an emulsifying or a gel like one, just a blow of the pump will normally be enough depending on the texture of the product and how well the pump works. If your cleanser is contained in a squeeze bottle, then you have to be more careful with the quantity of cleanser you squeeze out of the bottle because you might just waste product. Always remember that the right amount of cleanser is the one that enables you to spread it everywhere on your face easily and cover it all comfortably without giving you a feeling that it is either too much or too little. When you use the right amount, you will just feel that what you only need to do is to focus on massaging your skin nicely instead of feeling that you need to keep on rubbing that extra amount of cleanser on your skin so that it is not wasted. Has it ever occurred to you that the feeling of heaviness or of difficult absorption into your skin that you might experience when applying your moisturizer or cream is not necessarily because the cream´s texture is thick and heavy but because, among other reasons, you are using a lot more product that what it is needed? So, if you are sure that the moisturizer you are using is the right one for your type of skin, then you will know that you are using the right amount of moisturizer if the moisturizer spreads all over the face with easiness and by only using a thin layer of it. If you need some practising in finding that right amount, you can start with a smaller area of your skin where you think you can control better how much cream to use, for example all the part below your eyes and then use much less cream for your forehead. If you are using less cream than what your skin needs, you will feel your skin dry tight and looking dull, running the risk of becoming more vulnerable to wrinkles and fine lines. How much Facial Serum should you Use? Serums are most of the times concentrated skincare products that contain amounts of active ingredients in much larger dosages than creams or moisturizers. That means that you need to use less amount of serum compared to the amount of moisturizer you commonly use. The amount of serum you need to use is important because if you use more than what your skin can absorb, your expensive serum might go to waste or, if the serum contains skin peeling ingredients, you might feel some itchiness or even a light burning sensation. Now, if you use less serum than what it is needed, the benefits will obviously not be the ones your skin needs. Keep in mind that the consistency of face serums largely varies ranging from water like serums to more thickish serums. If the serum you are using feels like water, don’t be fooled to think that only by applying more, the serum will be effective because this is not the case. The effectiveness of a serum does not have to do with the product’s consistency but with the amount of active ingredients it contains. A thin skin serum may contain a large amount of active ingredients, so you won’t do any good to your skin by applying more to it but you can actually damage it because higher concentration of certain active ingredients can irritate sensitive skin. Eye creams and moisturizers belong to those type of products that it is really important for you to know how much to use on your skin. If you use more than what it is needed, you can wake up with swollen eyelids and the application of your makeup can become more difficult. If you use less eye cream, the sensitive skin area of your eyes will be prone to dryness and aging. So, especially if you have sensitive skin, you have to be careful both with the quality of eye products you are using and the amount you need to apply. In general, for each eye you will need a quantity similar to the size of a pea or even less. Also, remember not to use your cream very close to your eyes because you can trigger irritation and the appearance of millia. In conclusion, these were some general guidelines to follow if you are interested in knowing how much of your face products it is right to use but it is only you who, maybe with a little bit of trial and error in the beginning, will find that perfect amount which will make your skin balanced and happy.